We made six trips to the pharmacy in one day, plus a few more on the following days. Part of our back-to-China buying frenzy is getting a year supply of all our prescriptions filled. While we can get all the antibiotics we want in China cheaply and over the counter, other medicines, especially newer ones, are sometimes harder to come by or more expensive. Pharmacists aren’t used to filling a year’s supply of asthma and allergy medicines, so they initially had their doubts, but after a while they got it down. I sometimes forget that most people don’t do things like stock up on a year of medicines. After this year of sickness we are trying All The Things. The pharmacist asked why we don’t just get our medicines in China. Kevin told him how one of his medicines is $5 for a year’s supply in the States, but about $20 a month in China because we can only find the imported brand-name, not the generic. My antidepressant is similar - about $5 for a year’s supply here and $20 a month in China. It can also only be found at the mental hospital, conveniently located on the outskirts of the city in a remote location that is difficult to find. Some things are cheaper in China - like the allergy medicine Xyzol which has a generic in China that is 1/4 the price. But some medicines we’ve never managed to find in China and there is a quality issue as well. Deodorant just started to become available in some stores, but not many Chinese people wear it. It is also uncommon for girls to shave (we need to get back on this bandwagon! ), and since Chinese men rarely have beards, shaving cream and razors are less expensive here. Once when Kevin bought a beard trimmer another person in the shop asked what it was. The shop attendant said, “Oh, it’s for shaving your baby’s head.” Because they typically do that, believing it helps the hair grow back thicker. I buy some clothes for the girls online in China but I long ago gave up on shopping for myself. I find shopping stressful anyway, and it’s depressing when you have to buy 3-4 sizes larger than normal. Kevin has to get all his clothes here as well. We always buy our shoes here since our feet are too big. 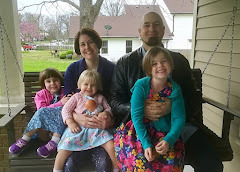 I can buy the girls’ shoes online, but they are usually not good enough quality to last through more than one child. This summer I bought two pairs of shoes just for myself, which is a bit much for me. My most ironic clothes purchase this year came from a consignment shop. My grandmother took me shopping to pick out some things for Christmas past and future. I was amazed at how heavy some of the dresses were. Definitely not going to make the cut. I decided to buy a pretty green dress. It wasn’t until I went to wash it I discovered the tags were all in Chinese! So I came to America and bought a second hand dress someone had brought from China! We can find some of these things online or at an import store but they are often pretty expensive. I like cooking with beans and we can get some dried beans (not canned) around, but I have discovered our black beans are super dry and it’s worth bringing some over. I have usually used Chinese “chicken essence” but I decided to try a bullion that wasn’t filled with MSG. I discovered most of them in the US are as well! I can and usually do make cream soups if I need them for cooking, but it’s nice to have a couple on hand if I’m trying to make a quick meal. We can get spices like cumin and cinnamon - and plenty of crushed red pepper - but not a lot of the others we like to use. Our bags are packed, ready to be loaded in the morning. 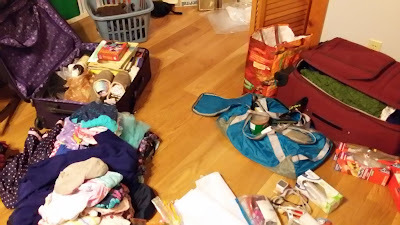 While we could technically bring 8 bags amongst us - and some families we know do bring that many or more - there is no way we could handle that many plus kids, and we wouldn’t have enough room to put 8 bags worth of stuff in our apartment! 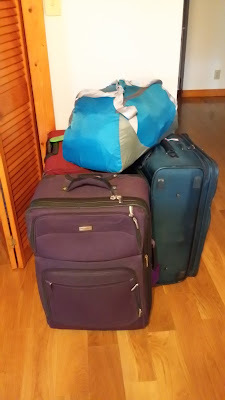 I think this is the most we have ever brought though - 3 suitcases and a duffle bag, plus a carry on suitcase, backpack, diaper bag, and kid backpacks. And a stroller. Yeah, it’s a lot. 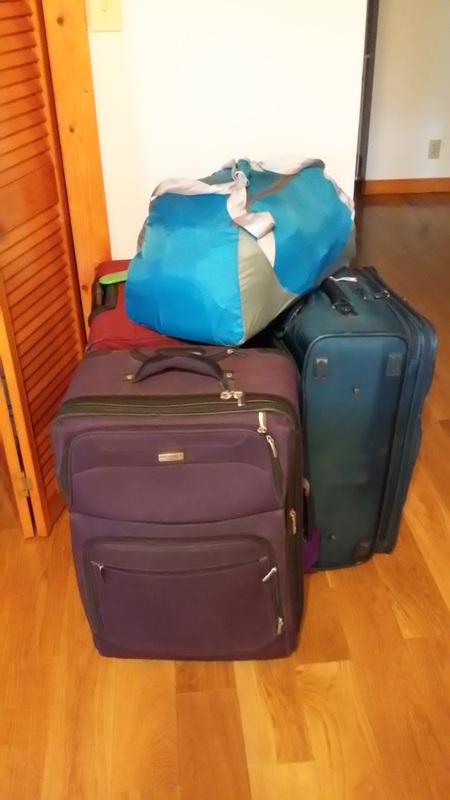 The fact that we could fit all those things perfectly into 4 bags is due entirely to my sister Becky and her magical packing skills. She really does have skills. I basically gather all our stuff in big heaps on the floor and she works it around and packs it so carefully that it all fits. Not only that, the bags were within a tenth of a pound of the weight limit. I keep saying she needs to hire herself out. I for one know quite a number of people who would be interested in utilizing her skills. I do think I get a little credit though for having/purchasing just the number of things to perfectly fit into our four 50-lb bags. That’s pretty great, right? We fit in everything I planned to bring! Either that or I’m forgetting something big. This seems like a decent possibility. I feel like I am forgetting something, especially since I lost my “take back to China” lists when my phone died a few days ago. We’ll hope we end up with everything essential. Sure the trees are nice, but where are all the people?? We are on vacation in the mountains, staying in a beautiful guesthouse for overseas workers. 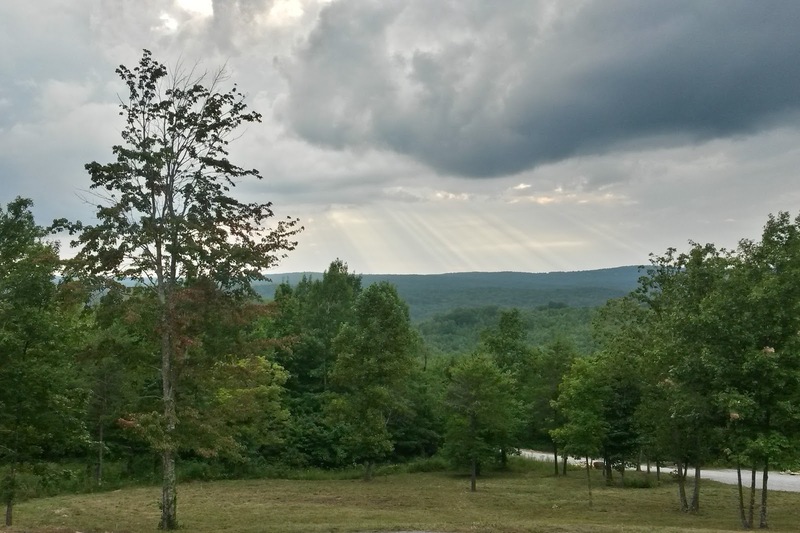 Inside our cabin is comfortable and tasteful; outside the large windows and spacious porch overlook an unobstructed view of green, rolling mountains. I tried to give a diplomatic answer about liking that one because it was our home, but liking this one because it was really nice and pretty. She was not satisfied. In fact, she was offended that we did not come to the defense of our China home. She looked around outside the windows and gave her final complaint. Ah, our social little city-dweller. While we are basking in the natural expanse, she misses knowing there are thousands of people all around. I guess it is all a matter of perspective. In another week we will return to our China home. I return with mixed feelings. I will be happy to get back into our own space, and I look forward to a predictable rhythm of days. But I have recognized that part of my predictable life rhythm follows the law of inertia. “A [Ruth] at rest will remain at rest unless acted on by an unbalanced force.” An unbalanced force...yes, there seem to be a lot of those in my life, propelling me out of rest and back into transition. While Juliana is always ready for the next adventure, a part of me never wants to leave where I am. Even if I am looking forward to my destination, I inwardly cringe at the prospect of making another transition. It doesn’t help that there is often a long day+ of travel in the way. But I know this about myself: I do not like change and I do not appreciate the unfamiliar. The first day in a new place is a shock to the system, as I scramble again to find my bearings. I suspect part of this is related to being highly sensitive. My senses are flooded with too much to take in; I cannot appreciate it until I have a chance to settle down and absorb the small things. The first day back, I recoil from America. Even as I appreciate the aesthetic beauty, I am turned off by the unconscious affluence and the ridiculous choices. Why don’t people walk anywhere? Why do people have so much stuff? How can their possibly be 50 different types of canned tomatoes?? I wrinkle my nose at the California desert. Dry and lifeless. Who wants a dirt yard and scrub brush “trees”? Don’t they know rivers are supposed to have water in them? But I slowly adjust to the desert, to the different colors, to the beauty of these resilient plants. When we leave, I miss the open sky and the view of sunsets. Those first days in Georgia, the trees seem to close us in. The sky is so small and the light is filtered through layers of humidity. Even at night the air is warm. I am shocked and a little frightened to see confederate flags on jacked up pickup trucks. What is this world we have stepped into? But the trees win me over. They always do. Myriad shades of green flutter in the breeze. The whole world is effortlessly covered in life. Bright colored birds flit from branch to branch and deer graze peacefully right in my parents' backyard. The southern drawl soothes instead of irritates. Maybe this is my world after all. I have returned to China often enough to know what it will be like. My heart will cringe as we land in the Beijing smog. The harshness of language will bruise my ears. The first time I step outside, I will be accosted by smells – pollution, stinky tofu – and noise – horns and loudspeakers and stores blasting competing music. I will dismally survey the gray and rust and faded yellow of ten year old buildings already falling apart. Why do we live here again? But then I will return to those familiar spaces. The wind will blow the mountains clear, and their rugged peaks will orient me again. When we walk to our little vegetable shop, neighbors will beam and hurry to welcome us back (mainly interested in the girls). I will pile some eggs in a bag and choose from the giant, dirt covered carrots while Juliana runs on the playground, thrilled to be back in the land where there are always friends waiting outside. It will feel right. If I am patient, I will push through the disorientation and rediscover the beauty in the familiar. Juliana will exalt in our stuffy little bathroom because there is her Strawberry Shortcake towel! And the tiny toilet is just the right height! And remember this little bowl for washing our feet?! I will step out onto the laundry porch, looking beyond the endlessly drying laundry hung above me, and appreciate the warmth of the sun and the pattern of rainbows the prism scatters on the tile floor. I will settle in the chair next to the bank of windows, momentarily hidden from all the surrounding neighbors and students. I will hear the chatter of birds and the wind rushing through the trees. We may not have the variety of birds or trees of Georgia. Our mountain view may be obscured by apartment buildings - and often by smog. But I will remember that the sunset is still beautiful even when I can't see the whole sky. A solitary tree still ripples joyfully in the wind. In the familiar, I will find balance again. In the balance, I will rediscover the beauty that is already all around.